NBC “Today” show producer David Chanatry and reporter Dylan Dreyer prepare for a live hit from the hill as they cover the March snowstorm for a network television audience. If you were on campus early Thursday morning and happened to see a satellite truck on University Place, you can blame the snow. 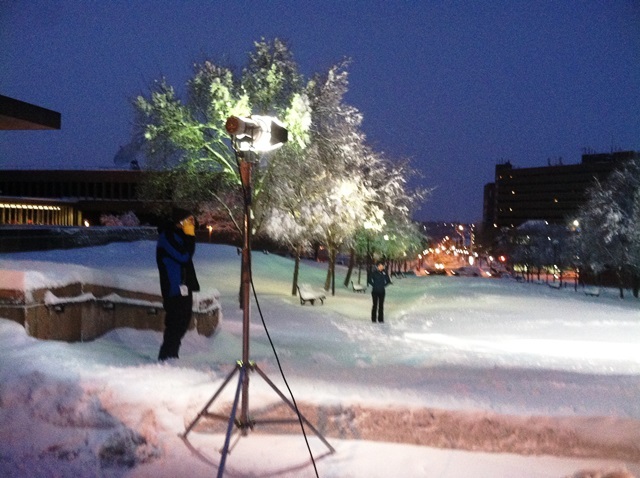 NBC’s “Today” show picked the SU campus as a backdrop for snowstorm coverage. With a foot of freshly fallen snow, the space between the Schine Student Center and Newhouse 1 served as a wintry weather window for a national television audience. NBC weekend meteorologist Dylan Dreyer was on the scene. “Yesterday I was in Chicago, then flew to New York City (where it was 50 degrees), but couldn’t get a flight to Syracuse,” Dreyer said. She decided to hop into a car and make the five-hour drive. “I drove through downpours in New York City, sleet as I made my way closer to Syracuse and then heavy snow,” she said. Dreyer spent time chatting on the air with weatherman Al Roker, talking about how the campus was quiet because students are on spring break enjoying someplace warm. Roker suggested she try Dinosaur Bar-B-Que . Due to the nature of breaking news, the NBC producer didn’t make the call to report from Syracuse until Wednesday afternoon. They contacted the University to get permission to set up shop on University Place beneath the Hall of Languages. Their appearance drew a small crowd, including Professor Rick Wright from Newhouse, who said he “had to stop” to see what was going on. He spent time chatting with Dreyer, as did a number of other people who stopped out of curiosity. One staffer brought out hot coffee to keep the TV crews warm. When asked for any advice for prospective broadcasters from Newhouse, Dreyer elicited the golden rule. “It’s important to be nice to people you deal with,” she said, since they can “help you out. I think part of the reason I am where I am today is because of the way I treated others,” especially in the broadcasting business. By 10:30 a.m., the crew was done with its broadcast day. Dreyer herself was awaiting her next assignment, but planned to stop at Dinosaur Bar-B-Que before leaving town.